Pond liners | FAQs | Site Map | Product Catalog | Bookmark this site! 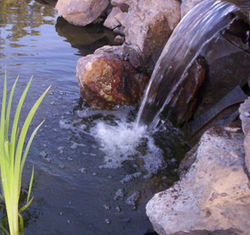 Click here to see our selection of Pond liners. Cold climate - if you live in a cold climate, beware that PVC liners can get both stiff and brittle and can even crack or be punctured. They are also sensitive to UV rays. Ruggedness - EPDM liners are more rugged than PVC ones, but you will likely have to pay for the difference by way of price. They are better for cool climates and have better UV resistance. Fish safe - if you plan to have a fish pond, be sure to get a fish safe pond liner. While liners that are not specifically fish safe can work fine and not cause any harm to the fish, it is best to be on the safe side. Price - as mentioned above, EPDM liners are generally more rugged and thicker than PVC ones. They also cost more. Keep in mind, though, that the cheaper liner might still be best for you - after all, it is not uncommon to change your pond after just a year or two. If you plan to rip your pond up often and start anew, go with a cheaper liner! Weight - PVC liners and multi-layer plastic pond liners are easier to fold, sculpt, and move around. If you buy a good pond liner and properly install it, you are going to create a pond that is going to last for many, many years. Buy that good pond liner from us, right here at Pond Depot. You will not be sorry!